Artful Affirmations: Tea Cup Tuesday-Yay! Hi Terri - Congrats again - as we're all waiting with you for the big day welcoming another precious little one into your lives! Again, you have shared the prettiest of teacups - and here's hoping you're enjoying a cuppa now, at peace knowing all is well - and celebrations are imminent! Your cup is beautiful. May your little new one come very soon so you may enjoy every moment. Terri que voce tenha uma semana fabulosa também! e que seu neto seja bem vindo! Sweet teacup, Terri. May your new grandbaby make his/her appearance very soon and Congratulations to all! Terri, I excited for you in your anticipation! Yes, your cup is lovely, and I was thinking how realistic the roses look. They are beautiful! Thank you for sharing in the midst of your special personal time, and know that I send blessings to all. Such excitement in your life! The teacup is lovely! The name of your teacup won't be in any china reference...yet. After the break up and closure of many manufacturers in the late 1980s, several smaller manufacturers bought up decals and began small operations. The most famous of those is Royal Patrician which closed in 2009. Mayfair, Crown Dorset and another I can't think of at the moment (must be over 35 LOL) are all from a manufacturer using some of the same decals and are still producing in the UK. We hope they make it! What a special event for you! I bet you can hardly wait! Lovely post! I wish, your grandchild will arrive save and spend everybody in your family luck and pride. It so sweet when a child is born. Your wonderful tea cup would be the right to drink a cup of tea meanwhile. I love the pretty roses on it. Thank you for sharing and for hosting this sweet event. Hello Terri....so sorry I've been missing, but I've loved catching up with the posts on this beautiful blog of yours! Thank you for your lovely message ...you are so kind. Hope all goes well for the mother-to-be! such a beauty this cup... still waiting for the most beautiful event in ones life, I cross my fingers, and I hope the baby is coming soon! What a Gorgeous teacup! i'm soo drooling here! lovely! I wish you and your loved ones joy and happiness on the new grandchild/bundle of joy! thank you for sharing and hosting. I thought you would already be posting pictures of your new grandchild.They come in their own time, and that makes the waiting all the more special. I can't wait to read about your new blessing! 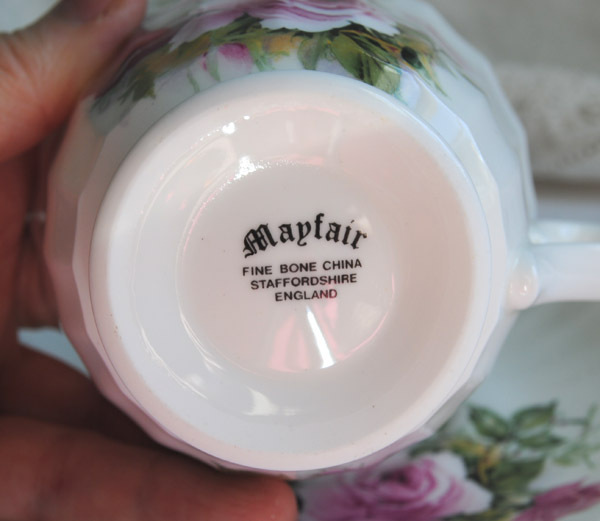 Your Mayfair teacup is lovely. Looking forward to seeing your tray and new cups. Enjoy your time away and the arrival of your precious grandchild. 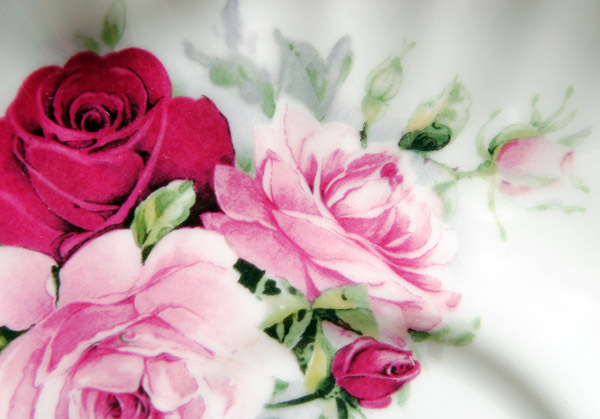 Another beautiful English tea cup for your collection! I love these fluted shapes and the flower decoration is lovely! I thought you'd be already announcing the arrival of your grand-baby, but I'm sure you'll soon be a happy and proud grandmother (like me) holding the little one in your arms. That is so exciting! I can't imagine anything more wonderful. That is a lovely teacup. I have a new one but I could not quite get it together to post today. 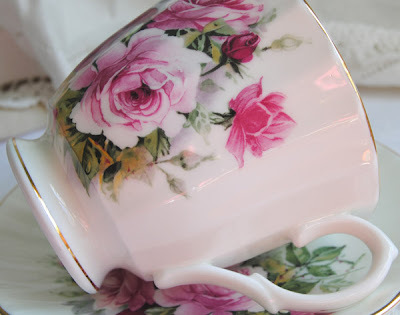 I love your cup...just my style...pink roses! I am hooked! Sending you lots of happy wishes for the birth of your new grandchild. 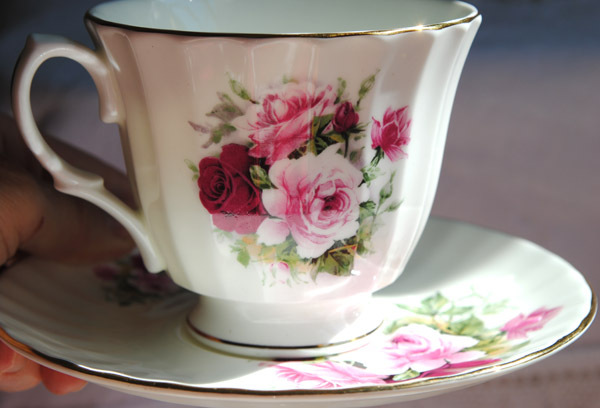 Oh Terri, what a dainty and elegant teacup....I just love the roses! Sending positive wishes and hugs that the blessed event arrives soon! Enjoy! Terri, the cup, is so pretty-and the rode pattern the most beautiful,one. I enjoy seeing all your lovely cups-I think you have a wonderful collection. I wish you a happy time awaiting your precious new grandchild. Yay..beautiful cup!! gorgeous! and CONGRATS on the newest little one...wishing you many blessings and sparkles to all your loved ones! Your teacup is very pretty! I know what you mean about the right size for a good cup of tea. It is that way. Enjoy your new grandchild! Congrats! Thank you for hosting! Thanks again for hostting this lovely weekly event...and it is always great to see all your new teacups! We're all so happy for you with the happily anticipated and joyful baby news; soon we hope!.., God bless you all with a safe and healthy delivery! Congratulations to you all! ~ The teacups are exquisite as always! Baby yet? So hard to wait but nice to share your teacup while you wait! Have a good week and here's wish you a reason to really celebrate. Best wishes for a safe arrival! Enjoy those cuddles. Oh Terri, blessings and congratulations on the little man's arrival! I'm sure you're counting the days until you leave to see him! I loved your posting and although I have a very modest collection of tea cups/cake plates, I love looking at your "Star of the Day" each Tuesday. Your Halloween picture is simply adorable...I think one of the best memories of Halloween is the homemade costumes! Have a lovely week. Gorgeous pattern. Reminds me of a set my grandmama had.